44 Montgomery — Sky Rider Equipment Co. 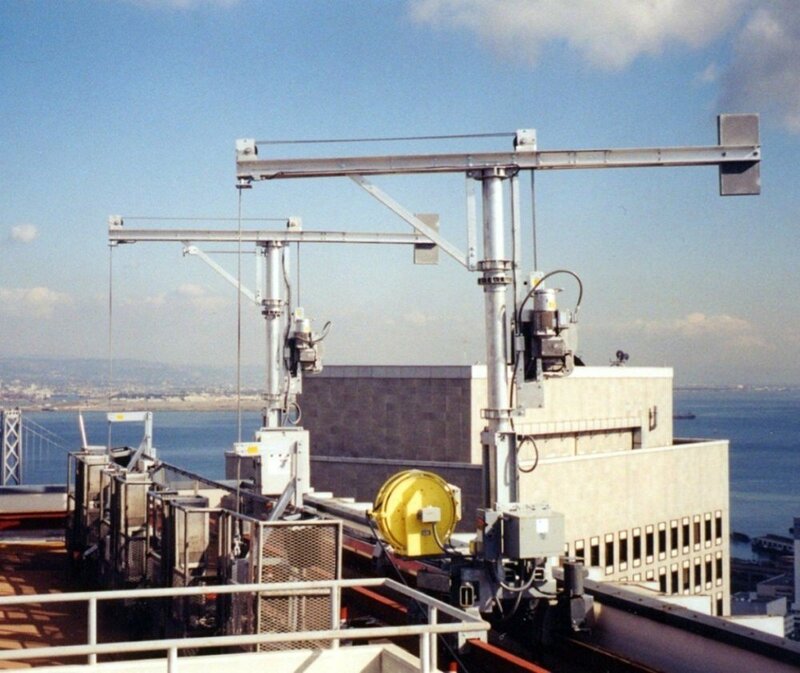 This 600 foot tall office building in San Francisco was retro-fitted with Sky Rider’s unique Roof Carriage System, including roof mounted hoists (to reduce the weight of the platform), and automatic leveling of the hoists via our special variable speed drive controls. The existing roof car was 30 years old, with a drum hoist that was difficult to service because the original manufacturer was no longer in business. The carriage track trolleys were also causing damage to the track due to numerous repair modifications over the years. Control of the roof mounted drum was from a powered reeler that added weight and did not function smoothly. Sky Rider was contracted to design, fabricate and install a new track carriage. 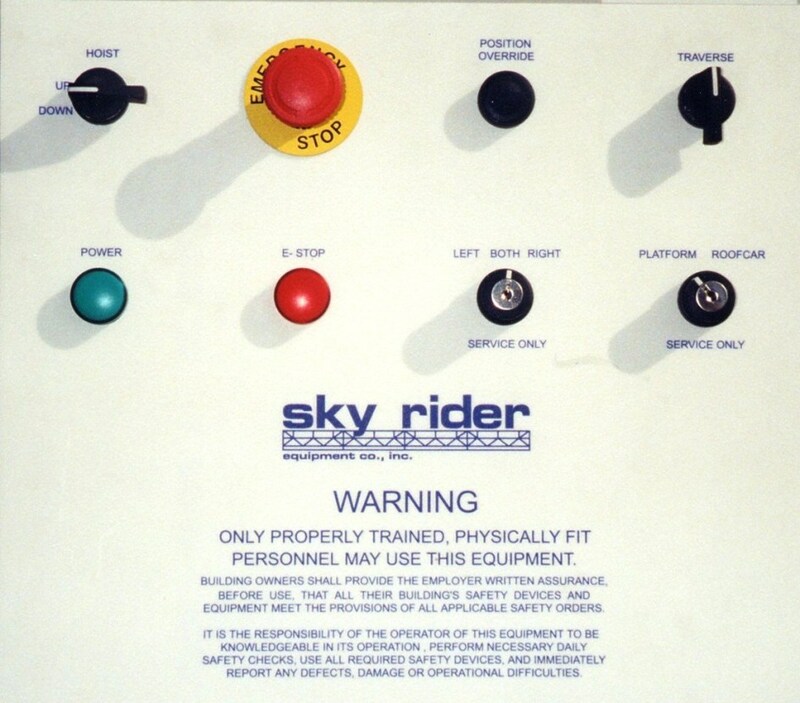 At a later date, Sky Rider also replaced the old platform. The new design included foldout and fold down front railing to permit easy glazing access for repair and replacement. The support arms were provided with counterweights to reduce the loading on the track. The hoists were mounted on the back of the aluminum Davit Arms, rotating with the upper arm assembly around the davit mast. Removable rotation handles permit rotation of the upper assembly from inside the platform, allowing the workers to safely enter and exit the platform from the roof. The Main Control/Receiver Panel provided many unique features. First, all hoist controls are sent between the platform and this panel via the ultra-reliable “Spread Spectrum” Radio Controller. This system eliminates the need for suspended control cables or wire ropes with copper cores, reducing maintenance costs associated with the deterioration of control cables and/or special, copper core wire ropes (typically 2 or 3 times more expensive than regular wire rope). 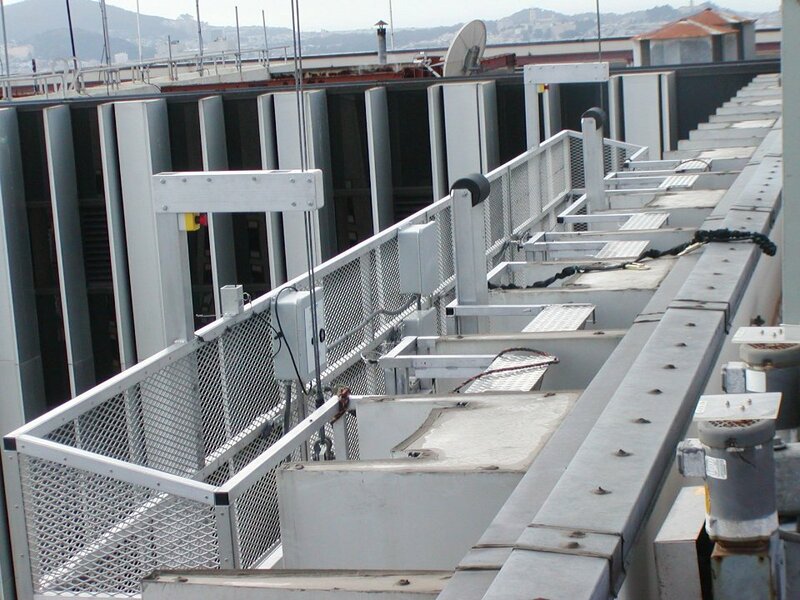 Two variable speed drives and a level sensor on the platform permitted automatic platform leveling, even with uneven weight distribution on the platform. 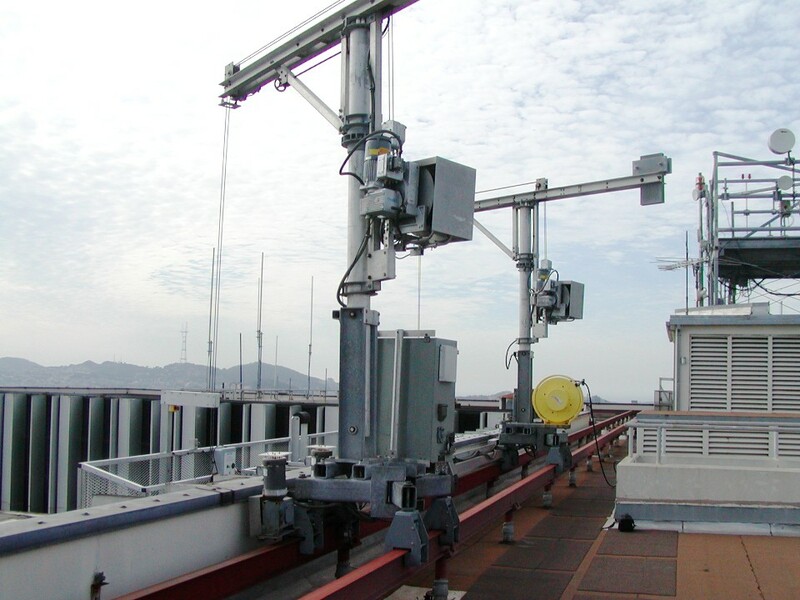 Additionally, the drives permit a “ramp up” and “ramp down” of the hoist speed, allowing for smooth stops and starts of the hoist motors, significantly reducing the impact load created by the instantaneous braking of most hoist motors. The entire system provides an extremely safe, cost effective method to wash and maintain the building exterior.